Nokia Belle refresh is the latest phone update for Nokia N8, E7, C7, C6, X7 and Nokia Oro. Here, we are going to guide you how to Jailbreak Nokia Belle Refresh using the coderus method. 1. 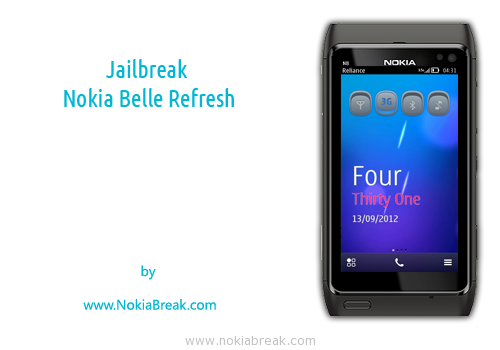 Download all the required files to jailbreak your Nokia Phone running on Nokia Belle Refresh. 2. After extracting the downloaded file, transfer the extracted file to your Nokia Phone using Bluetooth or Data Cable. Once you have transferred the extracted file to your phone you will be able to see them through File Manager on your Phone. If you are transferring through Bluetooth then files will be seen in the received folder. If you are transferring the files through data cable then make sure to transfer the files in the Mass memory root. 4. 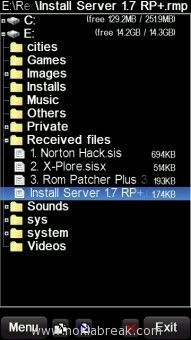 Next, Install Norton Hack.sis, X-Plore.sisx and Rom Patcher Plus 3.1.sisx on your phone (install on C: drive, if asked). 5. Once Norton Hack.sis is installed on your Phone, Open It. In Norton Security, Tap on the Options >Antivirus > Quarantine List. 6. Under Quarantine List, you will be able to see few files. You have to Tap on the Options Button and then on “Restore All“. After Taping on the “Restore All” button, a Message will popup on screen, saying “Do you want to restore all entries from the Quarantine”, Tap on Yes Button to continue. 7. Next, you have to delete Norton Hack.sis (Norton Security) from your phone. 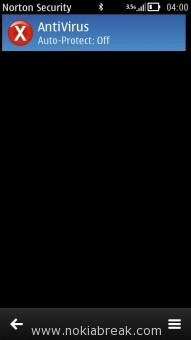 In order to delete the Norton Security, simply Tap on the icon for few second, a popup menu will appear with Delete option. 8. 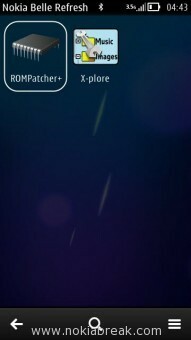 Now, Launch Rom Patcher+ on your phone. You will be able to see 2 options showing on the screen i.e Install Server RP+ and Open4All Rp+. You have to Select Open4All Rp+ option by Double taping on the option. 9. 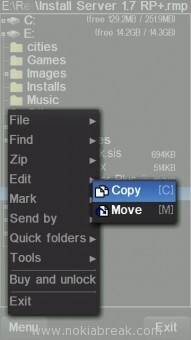 Now, open X-Plore and move or copy the “Install Server 1.7 RP+.rmp” file to to C:Patches. 10. Now, again start Rom Patcher+ and select “Install ServerRP+ 1.7 RP+” option and Tap on the Options button and select Add to Auto. You are done, now to check whether your phone is Jailbreaked or not, download this certificate error app and try to install it on your phone. If you are able to install it without any certificate error then it means your phone is Jailbreaked. [*] You can use the above Jailbreak method to Jailbreak Nokia N8, Nokia E7, Nokia C7, Nokia C6, Nokia X7 and Nokia Oro phone. We are hoping the above tutorial will helps you to Jailbreak Nokia Belle Refresh to install unsigned applications and open all closed ports on your phone. excellent . .bro very detailed . .thnx for sharing . .
Well, Well, Well. Thanks for ‘THE SIMPLEST’ Jailbreak option. It really works. Million Thanks to all ! i did everythign but when i tried installing the certificate error app, it shows expired certificate. Can I reverse the process? Can I remove it if I don’t want it or if it is not working properly? thank u very very mush..i had followed all the tips over & it’s works very proberlly on my nokia C7.. But when you want to restore all the files in norton u will see a massage that say: all file exist’s..i ignore it & move on with your tips.. But where ever it’s works..
i f i hacked my phone how can i reset it to normal?? This will format your phone and Jailbreak data will be removed completely. do i need to dont delete the rom patcher+ for stay my phone is hacked??? 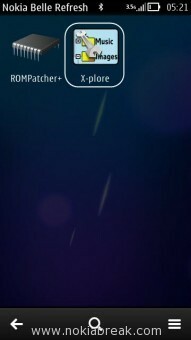 Will there be any problems if I uninstall ROM Patcher after I’m done? Can’t I directly download the hacking software from my phone? Or is it must to do it from a comp? thank u so much dear friend u did a great job but dude i ahve a problem here in installing TTPOD in my N8 it start installing but in the end it says unable to install can u tell me the solution ?? 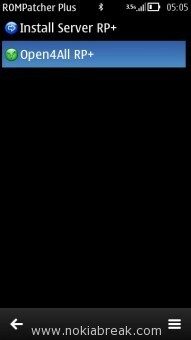 i just want to say thank you to all the members and contributor of nokiabreak.i got hack my symbian belle refresh(n500) and got no problem about it.thank you and more power.you guys are genius! any idea where did i go wrong ? Funciona perfectamente. Otro C7 hackeado. Muchas gracias. Works fine, thank you. thanx alot…. I followed ur instructions step by step and I installed all progs. you tutorial is very easy to follow and really step by step but i have a problem following them on the 10 step..i dont have a patcher folder..do i decide to make a new folder and named it patcher still not working (i copied the 1.7 RP)… then i tried to delte everything and start allover again and nothing happen again try to copy to folder other…nothing again copy it to root, .config, installed files, received, nokia… still no 3rd option…what can i do??? all of them is c;drive…. i dont know else i can do….please help me…please pleasse pleeaasseee thank you verymuch!! Yõµ are good,tanks man ℓ̊†̥ works on M̶̲̥̅γ̲̣̣̥ nokia n8 belle refresh after all †ђξ struggle to hack ℓ̊†̥. I have Nokia N700 with very latest Symbian. Was great for 18months but now saying Memory almost full, only about 2Meg free. I’m pretty sure the memory must be clogged up with old temporary files that I cant see and cant get at to delete. I thought this Jailbreak would fix it, but doesnt work for me. Trying to install Norton Hack it says not compatible, but I continue anyway…then it says Unable to install…Component is built-in. If I then try installing X-plore but it says Expired Certificate. Can anyone help please? Its a great shame because an otherwise excellent phone is being ruined because I cannot free up space on the basic memory. I have removed most Messaage data so I am sure it is these old temp files causing trouble. Neat guys! Kudos for this! My Nokia E7 (firmware Symbian Belle Refresh) C: drive is not found PATCHES folder!!! Create Patches folder? but what else folder and files?? it works! but the X-Plore that came in the package had ‘certification error’ so I need to install the newer version provided by warriori. Thanks a lot! Your instruction is very clear and easy to follow even newbies like me can do it hands down. i hv complited process upto the xplore instolation.but afer this i hv coppied Install Server 1.7 RP+.rmp file to the patches folder but its not seen in rompatcher when i launch it.what can i do help me…. x plore certificate expired . . . What to do nw? what is the use of jailbreak? thanks guyz for ur beauti4 commitment..my n8 belle refresh is finally hacked! and ur tutorial is simple to follow..
thanks a lot for this wonderful work,finally able to hack my nokia c7 00 .great work!! Am in need of ur help admin….. 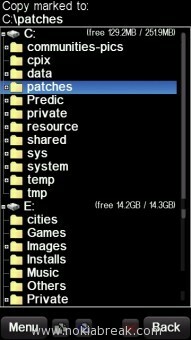 I install TT.Pod on my Nokia E6 belle refresh bt it refuse to open…. If i try to install the patch for run it will say component built in.. Please how can i resolve this issue? Thanks buddy. Worked great on my Nokia C7-00 Belle Refresh. I followed the instructions but I became unable to finish step 10. 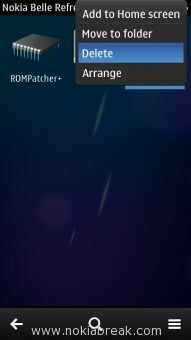 When I open rom pacher there remains only Install Server RP+ and Open4All Rp+ but not the “Install Server 1.7 RP+.rmp”! Please help sir!!! i can’t find the Required files to Hack Nokia 500. Now what to do? Amazing tutorial dude. thank you for this. I dont sure if ur here still, i have a N8 now, and i do want jailbreak it, now i do everything well but cant have to install the X-plore…it says certificate error at first and now saying its currupted…. What will i do?